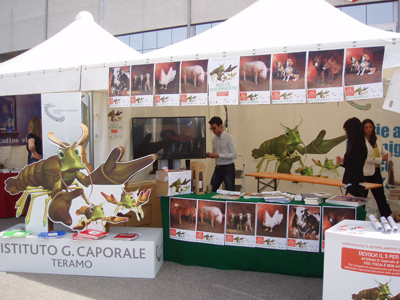 The G. Caporale Institute exhibited at the 23rd Teramo Agriculture Fair held on 8, 9 and 10 April in the municipal stadium area of Piano d'Accio. In view of the context, posters, calendars, brochures and publications about the Institute's activities in the field of food safety and protection of the local gastronomic heritage were distributed free of charge to visitors. On this occasion, a new communication campaign was launched in support of the "White-clawed Crayfish " project, using information and promotional material such as postcards, posters and stickers. The G. Caporale institute has been working for several years on the "White-clawed Crayfish " environmental protection project, designed to repopulate watercourses with the crustacean of the same name. The process of extinction of this crayfish, which is characteristic of some rivers in Abruzzo and Molise, is a worrying sign of the gradual deterioration of internal waters in Italy. The project, financed by funds raised by the Institute through the Italian government's gift aid scheme, has already led to the construction of a hatchery at the source of the River Tirino in the municipality of Capestrano (AQ). Aware of its leading role in safeguarding the local natural habitat, the G. Caporale Institute has invested heavily in repopulating the rivers and streams of Abruzzo and Molise with white-clawed crayfish . Italian taxpayers wishing to donate 0.5% of their income tax to this project under the gift aid scheme just need to sign the "Health Research Funding" box in their income tax return, and enter the G. Caporale Institute's tax identification number: 8000 6470 670.